Clothing/Jewelry Description A black shirt, a red leather vest and black pants. Distinguishing Characteristics African-American female. Black hair, brown eyes. Taliaferro had copper-colored highlights in her hair at the time of her disappearance. 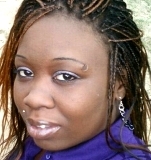 Her navel, left eyebrow and right upper lip are pierced and her ears are triple-pierced. Taliaferro has a long keloid scar on her forearm, extending from wrist to elbow. She has the following tattoos: the word "Loyalty" across her upper chest, paw prints down her right side extending from shoulder to foot, writing on the side of her neck, an unspecified tattoo on her lower back, and several tattoos on her arms, including the name "Will" and a face with a cigarette in its mouth, on her upper right arm. Photos of Taliaferro's scar and some of her tattoos are posted with this case summary. Taliaferro was last seen in Detroit, Michigan on April 26, 2014. She lived with her boyfriend, Johnathon Michael McMahen, at the time of her disappearance; a photo of him is posted with this case summary. McMahen was a member of the Satan's Sidekicks Motorcycle Club. According to the club rules, only men can be members, and women are considered to be property of the men. While she was seeing him, Taliaferro was also intimately involved with other men, including at least one other member of the motorcycle club. Her relationship with the other club member was widely known within the club. Taliaferro was last seen while in a heated argument with McMahen at the club headquarters in the 48300 block of east Davidson between 1:00 and 2:00 a.m. They got into an altercation in the restroom which turned physical. Taliaferro was heard telling McMahen she didn't want to leave the club with him, and McMahen tried to bodily pull her out of the club. She removed the motorcycle colors she had been wearing, clothes which proclaimed her to be McMahen's property, and seemed very angry and afraid. Witnesses saw McMahen pin her to the floor with a knife at her neck. Later, the couple went outside and Taliaferro sat in the passenger seat of McMahen's black GMC Jimmy pickup truck. McMahen stood in front of her, blocking her exit, and they continued to argue. When Taliaferro's best friend, Alfreda Robinson, tried to approach them, McMahen wouldn't let her speak to Taliaferro. Robinson went back inside the clubhouse for about twenty minutes, and when she came out, they were both gone. McMahen returned to the clubhouse alone about forty-five minutes later. During the early morning hours of April 27, McMahen awakened his Merry Wade and Jason Wedel, both of whom were staying with him and Taliaferro, and asked them to leave the house so he could speak privately to Taliaferro. Wedel never saw or heard Taliaferro in the house that morning, but he assumed she was asleep in her bedroom. While Wade was waiting for someone to pick her up from the house, she tried to call Taliaferro twice, but both calls went to voicemail. When Wedel called McMahen later that day, McMahen told him he had broken up with Taliaferro and kicked her out of the house. That afternoon, McMahen went to a T-Mobile store and sold Taliaferro's phone. Wade came back to the house on April 28 to get some belongings, but when she tried to go into the basement to get them, McMahen stopped her and went into the basement himself to fetch what she wanted. Wedel didn't return until April 30, and when he did, McMahen told him Taliaferro had three days to collect her belongings and that he would be moving a new girlfriend in after that. Taliaferro never did come back to the home, though, and Wedel helped McMahen move her things into the abandoned home next door. They were later recovered by the police. In the days following Taliaferro's disappearance, McMahen contacted Randy Hendricks, who regularly cleaned his home, and asked him to clean his basement with bleach and water. For safety reasons, Hendricks refused. While he was cleaning, he found dried blood on McMahen's bedroom door. Robinson repeatedly tried to contact Taliaferro by phone, but she never saw or heard from her again after April 26, and neither did any of her other friends or her family. Robinson eventually filed a missing persons report for her. Paisley Almore, McMahen's ex-girlfriend, spoke to him several times about Taliaferro's disappearance after she found out about it in May. When she asked him about some bloody clothes at the abandoned home next to his, he told her Taliaferro's clothes were bloody because "when you choke someone and they take their last breath the person coughs up blood." He told her he and Taliaferro had gotten into a fight after he found out about her infidelity. At first he said Taliaferro had jumped out of his car, but after Almore challenged him, he admitted he had choked her in his car. He said when they got home and he got out of the car and she didn't follow him, he assumed that Taliaferro, who was drunk, had passed out. When he went back to try to help her, he realized she was dead. McMahen told Almore that he put Taliaferro's body in the back of his truck and then dumped the body in a building, but didn't say where. He said he thought he would get away with it because "with no body there's no case." McMahen was arrested for Taliaferro's murder, and tried later in 2014. At his trial, a cellmate of his testified that McMahen had confessed the crime to him, telling the same story he told Almore. The county medical examiner testified that McMahen's statement about Taliaferro coughing up blood as she was choked was consistent with what would happen during strangulation. McMahen was convicted of first-degree premeditated murder and sentenced to life in prison. Taliaferro's body has never been found in spite of extensive searches. Updated 1 time since October 12, 2004. Last updated July 20, 2018; casefile added.